I left my hotel room to get dinner and found this waiting for me in the hall. It really confused me because it's not like I sent any laundry out to be done. Was this somebody else's clothes? Or did I actually have them clean my pants in my uncaffeinated state? 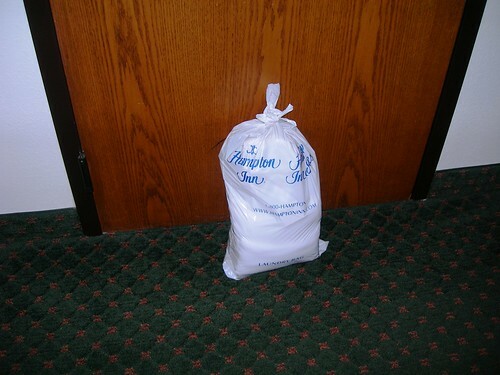 Hampton Inns are generally nice hotels. They're not fancy; they are the lowest price properties in the Hilton chain. But they are mostly consistent from city to city. The Hampton Inn in Clemson, SC rocks. The staff is friendly and helpful. Coffee is available in the lobby all day. And, despite the SC summer, the air conditioning had no problem keeping my room at 65 degrees. Of course wi-fi is free, and the continental breakfast is free. But this is my favorite example of simple, excellent service. On Wednesday, I left the hotel early and was back by 11:00 AM. Housekeeping had not made up my room yet, which is fine. It's not like I used 4 towels and all the shampoo that morning. And my bed was still mostly in one piece so I didn't really need it to be made. So I just stuck the "Do Not Disturb" tag in my key slot, plugged in my computer and got to work. And they left me alone. Do you have any idea how unusual that is? At "nicer" hotels, house keeping thinks the "Do Not Disturb" sign means, "Knock loudly on my door at 10:15 AM instead of 9:45 AM. And then call me at 11:00 AM. And then call at me 2:00 PM to tell me in a mildly annoyed voice that you won't be providing service today because I left the sign on the door." At this Hampton, however, housekeeping had a different take on, "Do not disturb." They took it to mean, "Do not disturb." I peeled myself out of my chair at 8:00 PM and realized I hadn't moved or eaten much during the day. I decided to head out to Taco Bell. And that takes me back to the beginning of this post and the mysterious bag of underwear. 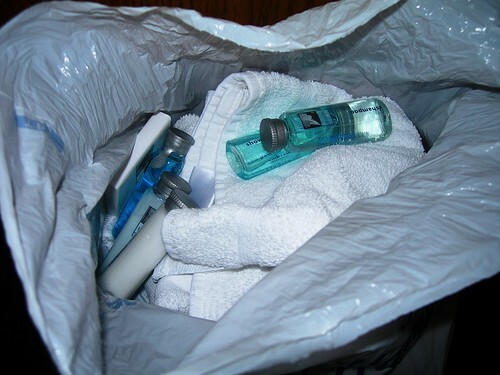 The fresh towels and toiletries they couldn't put in the room due to the "Do Not Disturb" sign were waiting for me right outside me door for whenever I decided to leave. I've stayed in $200, $300, and $400 a night hotel rooms and never had this kind of service. It's simple. It's cheap. It's respectful. And it works. That is awesome service for them to think of you still and give you fresh towels and toiletries without disturbing you! Agreed! My husband and I stayed at a Hampton Inn recently, a brand new one, and it was lovely! I was a bit surprised actually. That's wonderful. Good service always makes an impression! That is the kind of wonderful, thoughtful service that i so appreciate. It's difficult to find these days. Great post. Disney was the same way when we stayed in their hotels. I share your excitement about great service. Too bad, it's so rare these days. To honor those "Memorable Merchants" in my local Portland, Oregon area, I've started a category on my blog with the same name. Keep finding those diamonds in the rough. They're priceless. I agree with you, Hampton Inns are the best!! I also found their service to be great. I would definitely recommend them to anyone looking for a hotel. Don't just tell us, let management know and corporate know...a quick email is all it takes to put the praise in the right hands. I concur. I stayed at a Hampton Inn in NYC for 6 nights on my honeymoon. The staff really went out of their way to make our stay wonderful. It was a great experience. wow nice service...good job for the staff of the hotel!! Wow, that's awesome.So nice of them to do that.Wonderful service! What a wonderful idea. I love it. Beautiful, need to respect the privacy.. Sometimes, a small event can bring the brand to top of your mind isnt it ? @Vera: Not enough places do this. @Unlikely Oilfield Wife: They are very consistent which is nice when going to a different city. @Daisy: The simple things make a difference. @lot 2 learn: Good to hear. I think I stayed at a Doubletree last time I was in BNA. @Buggys: Thanks. It's great to see service like this. @Jennifer Leigh: That's good to hear. I wouldn't have expected it from them since they have the location going for them. @Kat: Combined with the HHonors program they are are nice deal, too. @Grace: That's a good point. @Ana: It worked out well. @Anonymous: It seemed like a nice town. I like the downtown area. I couldn't get much feel for the campus though. @silvergirl: It seem like a regular practice for them, too. @Krish: If all business just did the small stuff and picked the low hanging fruit think about how much better things would be. It's not the exciting, big initiatives that make the difference. It's doing little things well.